Vivo India has officially launched the younger brother of V15 Pro, which was introduced earlier this year. Launched at Rs 23,990, the Vivo V15 Pro gets subtle changes as compared to the elder version. The phone misses out on In-display fingerprint reader, rather sports traditional fingerprint sensor at the rear. In terms of design, the handset carries similar design as that of V15 Pro. The main underlines of the phone are gradient finish, triple AI based rear cameras, pop-up selfie camera and much more. 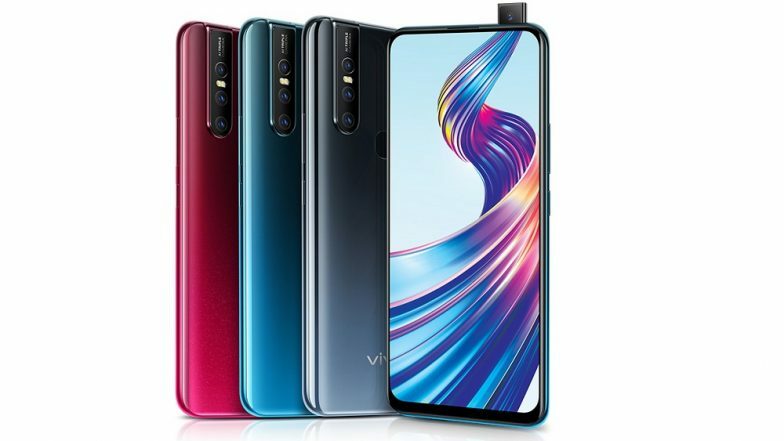 Vivo V15 Pro Smartphone With World’s First 32MP Pop-up Selfie Camera Launched; Priced in India at Rs 28,990. The smartphone will be offered in three exciting shades - Glamour Red, Royal Blue and Frozen Black. Slated to go on sale in the country on April 1, the phone will be available online at Amazon.in, Flipkart, PayTm Mall, Tata CLiQ and Vivo India E-Store. The phone will also be retailed through offline channels. On the specification front, the phone gets a 6.53-inch FHD+ Display with 19:9 aspect ratio and resolution of 2340 X 1080 pixels. Under the skin, there is a MediaTek P70 chipset clubbed with 6GB of RAM and 64GB of internal space. The phone also comes with memory expansion option up to 256GB via microSD card. Samsung Galaxy S10 5G Smartphone To Be Launched on April 5 in South Korea. For photography, there is a triple camera setup at the back wherein the primary shooter is a 12MP lens and the secondary lens is an 8MP shooter. The third lens is a 5MP camera. The front camera is a 32MP pop-up shooter incorporated for selfies and video callings, which is similar to the one seen on V15 Pro. Nipun Marya, Director Brand Strategy, Vivo India said, "At Vivo, we believe in bringing the best in technology and user experience to our consumers. The recently launched V15 Pro received an overwhelming response from the consumers, and with the launch of V15 we further want to provide our consumers with the opportunity to experience innovative technologies such as Pop-up camera and Ultra FullViewTM display at an exciting price point."